For today, I offer the life story of Venerable Righteous Princess Saint Evfrosynia of Polotsk, whose feast day we celebrate on May 23 (June 4). The following biography by Alexander Medeltsov originally appeared in The Bronze Horseman, but the following version is from Saint John the Baptist’s newsletter. As you read it, consider how modern people think about Christianity’s supposed subjugation of women, the medieval estimation of knowledge and education, and the place of women in the Middle Ages. It would be impossible to envision the spiritual life and culture of Belarus and its Orthodox Church without St. Evfrosynia of Polotsk. A princess, abbess, and outstanding educator, she is greatly remembered by its people. The renowned ascetic, one of the most erudite people of her time, lived in the 12th Century, during the great epoch of pre-Mongol Rus’. It was a time in which the people of the ancient Russian State accepted the Orthodox Faith, and consolidated it not only not in themselves but in monuments of architecure, literature and art. During that period, Polotsk, with its churches and monasteries, and its episcopal throne, was a great center of education and book production. The Nikon Chronicle relates that Prince Isyaslav of Polotsk (+1001) “was devoted to reverence for books.” In running chronicles produced in Polotsk, events were recounted by those who had been actual eyewitnesses to them. It was here that, in about 1101, Predslava, later to receive the name Evfrosynia of Polotsk, was born. She was the daughter of Prince Georgi and the granddaughter of Vladimir Monomakh. As a child, Predslava developed a love for books. Monastics taught her to read and write. Her “Life” describes her extensive abilities and her striving after scholarly knowledge. In the prince’s residence there was a large library, consisting predominantly of religious books, but also containing secular literature. In the monastery, Evfrosynia dedicated herself entirely to learning. In the book depositories of the Fathers of the Church, she would discover the works of Roman and Byzantine Theologians, Slavic luminaries, and chronicles. After spending several years in the monastery, Evfrosynia moved to the Sophia Cathedral, where as it says in her life, she “began to write books with her own hands.” She wrote down her own instructions and prayers, and translated Greek-language works. Evfrosynia taught people to love one another, to be kind-hearted and not to permit themselves envy, strife, hatred, or evil passions. Erudition and literary talent were characteristics present in her writings. A sermon she addressed to nuns has come down to us: “Here I have gathered you together, like a hen that gathers her chicks under her wings, and with a happy heart I care for your salvation and teach you, in hopes of seeing the fruits of your labors. I have already sown so many words of God’s teaching in the field of your hearts, but those fields do not remain in place, and do not bloom with virtues and perfection. I implore you, my sisters, become pure wheat of Christ, and be ground on the mill-stones of prayer, humility and pure love, so that on the Feast of Christ, you might be sweet, fragrant tobacco [flowers]. She greatly expanded literacy in Polotsk, first establishing a women’s monastery, and then a men’s monastery, in which there were scriptoria. From those sciptoria, books were distributed throughout the land of Polotsk. Schools had existed there before the coming of Evfrosynia, but her establishing of new monasteries and her educational activities gave new impetus to the spread of education. Thanks to Evfrosynia, many of the people of Polotsk were able to attain literacy, and not only the wealthy, but also the common people. Both in curriculum and in teaching methods, Evfrosynia’s school was one of the most advanced of its time. With reverence for all that was beautiful, Evfrosynia became the first patron of the arts in the Principality of Polotsk. In the 1150s, at her direction, a local architect named Ioann erected a Church of the Savior along entirely new architectural lines. By the way, Evfrosynia was not simply the talented master’s patron, but also his advisor, assistant, and inspiration. The Church of the Savior, or the Savior-Transfiguration Church (often also called the Savior-Evfrosynia Church), became the masterpiece of the Polotsk architectural school. This magnificent monument of antiquity continues to amaze, both for its elegance and for the soundness of its construction. How many centuries have passed, how many wars have roared through, and yet Evfrosynia miraculously continues to protect it. Even today, it can tell us a great deal about the Saint’s outlook, for in the church frescoes, we can see the figures spiritually near and dear to her. Evfrosynia of Polotsk is also remembered as the patron who ordered a masterpiece of ancient Russian art, a Cross made in 1161 by the Polotsk master-jeweler Lazarus Bogsha. There are no earlier Crosses like it in Rus’, and later ones are all to a greater or lesser extent copies of that holy object. Rare materials - precious stones, gold, silver, and enamel, on a foundation of cypress wood – were all utilized in fashioning the Cross. Unfortunately, through a series of events [during World War II], the Cross made by Lazarus Bogsha was lost. In 1992, when the Millenium of the Polotsk Diocese and of the Orthodox Church in Belarus was being celebrated, it was decided to recreate the Cross. On August 24, 1997, Metropolitan Philaret of Minsk and Slutsk, Patriarchal Exarch to all Belarus, blessed an exact copy of the Cross of St. Evforsynia. Currently, it is kept in the Polotsk Cathedral of the Savior-St.Evfrosynia Women’s Monastery. Throughout her life, Evfrosynia never abandoned the idea of visiting the holy Christian sites. In 1163, she left Polotsk and set forth on a journey. Upon reaching Constantinople, she visited the Church of the Holy Wisdom [Hagia Sophia], about which so much had been told in Rus’, and she received the Patriarch’s blessing. Everywhere, she was warmly greeted as an honored guest. In late April 1167, she reached the city gates of Jerusalem. However, she did not remain in the Holy Land for very long. She soon fell ill, and in May 1167 departed to the other world. 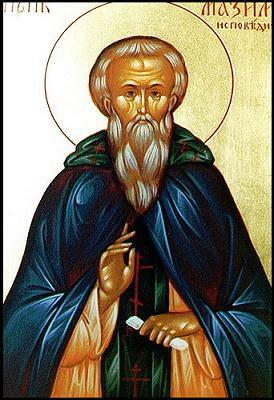 Thus concluded the earthly path of the great ascetic and englightener, Venerable St. Evfrosynia of Polotsk. She was interred in Jerusalem, at the St. Theodosius Monastery of the Most-holy Theotokos. In 1187, when Jerusalem was taken by Egyptian Sultan Salahuddin, Russian monks who were leaving Palestine removed the relics of St. Evfrosynia, and brought them to the Kiev Caves Lavra. In 1901, the remains of St. Evfrosynia were transferred to the Savior-Evfrosynia Monastery she had founded in Polotsk. In 1547, Evfrosynia of Polotsk became the first woman to be canonized as a Saint by the Russian Orthodox Church. With her strength of spirit and her educational activities, she raised up the level not only of her native Polotsk, but of all Belarus and the Orthodox Church. Quite a different commemoration for “V Day,” no? The decadence and idiocy of our contemporary society cannot and will not last, but the prayers of Saint Evfrosynia will endure. May she petition the Lord for the true enlightenment of Christians and of their neighbors everywhere. I would like to wish Western Christians a beneficial Lent. Yesterday, I came across a remarkable story about the completion of a new temple in Yasenevo near the southern edge of Moscow, evidently the neighborhood with the highest elevation in the capital. 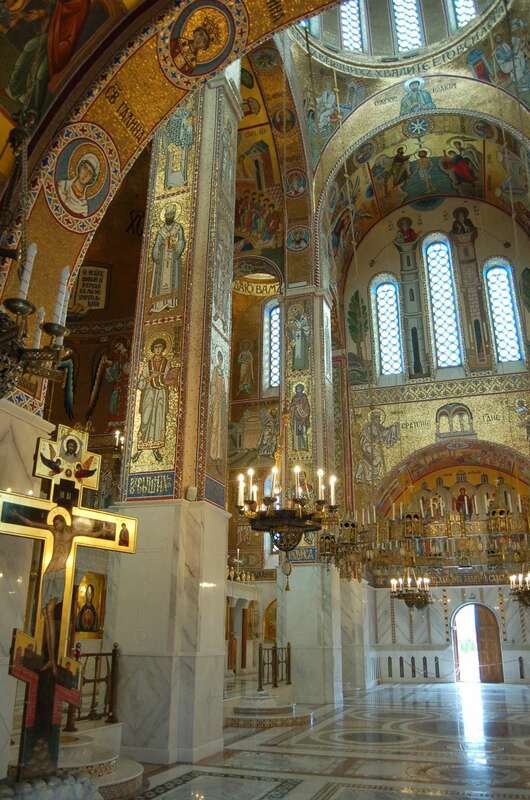 Please read the short article by Andrew Gould in the Orthodox Arts Journal, “A Miracle of Liturgical Art: The Church of the Protection of the Mother of God at Yasenevo.” The story has many gorgeous photographs (linked to larger versions if you click them). Likewise, the astonishing mosaic work was not the work of a professional studio, but of students and amateurs, all volunteers. There was one professional iconographer hired to draw the great Pantocrator, but beyond that, the work was planned by highly-capable art students. They could not afford to buy Italian tesserae for the vast areas of gold, so they asked for donations of gold jewelry from across Russia, and developed their own technique for depositing the gold onto ceramic tile fragments. The mosaic workshop was run by a retired master who taught anyone who showed up. On the day I visited, she introduced me to her crew for the day – a hairdresser, an economics student, an architect, all there on their day off from work to come lay tesserae, and doing work like skilled masters. In total there were at least 225 of these volunteer mosaicists, some of whom arrived with no skills, but only a life-long dream of making an icon, and ended up creating works of incredible beauty. My guide, Elena, explained that almost everything was built like this – the landscaping, the marble work, the unexpected and charming decorations that could be seen virtually everywhere. I found that the construction site felt like a liturgy – the workers could feel their priestly role in this work. Everyone involved in the project recognized that a miracle was taking place – that God had ordained that this project was to be different from any other – that this church would be built only with love, and that it would outshine all others. Glory to God! I realize that I sometimes sound repetitive, but truly consider the import of this new “people’s temple” in the heart of the former Soviet Empire—built by the normal folks out of love in order to glorify neither the revolution nor the worker but God almighty. And it is exquisitely fine! Could anyone have predicted such an accomplishment thirty years ago? Amazing! Gould includes links to a panoramic virtual tour on the temple’s web site as well as to the patriarch’s homily at the consecration. The temple page has an extensive photograph collection and additional virtual tours. One of the article’s comments notes that the Pantocrator (ruler of all) icon of the Lord is not in its customary location in the dome but rather in the apse behind the altar. This is where we should expect the icon of the Protection—especially in a temple dedicated to the Protection. That move is curious, but the result really impresses. The virtual panorama allows you to see two of the eastern side domes, and both of them depict Christ—the northeast one is standard, but the southeast dome has a young, beardless Christ. I assume that the western side domes also depict Christ, but the virtual tour does not include them. I do not know what to make of the instances of προορίζω in the New Testament. I am not a biblical scholar or a theologian, but I am confident that it cannot mean what Calvinists take it to mean. As others have noted, scripture has much to say about the nature of God, directly and through examples and images—especially that God is love and that he is good—that he “is long-suffering to us-ward, not willing that any should perish, but that all should come to repentance.” Now, you will say, undoubtedly, that your understanding of predestination coexists with such a nature of God, but I think that is forcing a square peg through a round hole—it does violence to our understanding of love and goodness. You may speak about human blindness, but I cannot accept any system that undermines the very foundations of human judgment. God is not a deceiver. You may point to the fall and human depravity, but such a path makes the ministry of the law, the prophets, and the apostles a big charade. God only delivers a message to beings that can understand it—and God is not a deceiver. You mention the first chapter of Ephesians. Like I said, I don’t know what προορίζω really means. It doesn’t appear to be a common word (according to Perseus, at least), and even in the New Testament, it appears only a handful of times in Paul’s letters and in Luke’s Acts. It literally means to pre-establish or mark beforehand limits or boundaries (horizons is a related term). There are many ways that one could interpret the passages with it—the standard Calvinist way, or the Arminians’ Calvinist rejoinder method, wherein God foresees men’s action and then sets up the world accordingly. I found it interesting to see that Augustine argued against that very interpretation in his On the Predestination of the Saints. His point is that God’s grace would not be grace if it were doled out on account of human worth. For him, it seems, any question of justice or merit confuses the fundamental truth that God’s grace is totally a gift. That is a good argument, but I don’t think that we have to resort to the Calvinist or this anti-Calvinist interpretation. Perhaps, God’s predestination—God’s setting of markers done outside of time from all eternity—is simply God’s assignment of roles and natures. This might be general—our general human purpose—as well as individual—in how we fit into the providential unrolling of history. I am very uncomfortable in dealing with the later; I have no idea how providence works, and yet it seems that God does work intimately through the messiness of history. God certainly knows all possible worlds—all the roads not taken and the trillions upon trillions of contingent possibilities for our cosmos. Maybe, he threads the loom to maximize goodness based on what free creatures do (per Leibniz). Maybe, he assigns definite roles regardless of our actions, and it is up to us to play (with grace given to all) the part assigned to us, but we, for no reason (that disgusting quality of evil), fall short of the ideal performance. A simple reading of several biblical narratives makes it seem that God has assigned some pretty dreadful parts to certain individuals (pharaoh, Judas), which lends credibility to Calvin’s evil puppet-master interpretation of scripture. On the other hand, maybe God’s providence is simply the skill of the master lemonade-maker, who creates sweetness from that which is bitter—men’s folly isn’t God’s will, but it is co-opted by God for the greater good. Maybe, some men get bad parts (there has to be an Iago in Othello), and God’s ultimate judgment will take that into consideration, just as the critic grades a performance with an eye to the material and what is possible given the constraints of the role. Maybe predestination is simply a way of speaking of God’s grand salvific formula—the elect are the chosen people . . . chosen as instruments to enact the Gospel Plan—that wonderful military operation wherein the Lord stages a counter-offensive to regain lost territory. Abraham, the Hebrews, the apostles, the preachers and converted of the Great Commission, the Christians of our day who strive to live in hope and in the light of the Resurrection . . . maybe this is the meaning of predestination—that the pilgrimage routes to the New Jerusalem, the path of the righteous, or the ingenious recipe of the master lemonade-maker is what is marked out from the foundation of the world. There is much ambiguity in the scriptures. Many are called but few are chosen—perhaps the chosen are simply the ones who answer the call. I don’t know. I only know that God is good, and that we must reject Calvin’s laying evil at God’s feet.